Today’s guest post recipe is perfect for those of you who are on vegetarian diets and looking for delicious homemade foods that you can snack on. The Lasagna noodles are transformed into tasty chips for snacking in this easy to make recipe. It will make approximately 8 servings at 100 calories per serving. This recipe is one that the entire family can enjoy and a great alternative to sugary unhealthy snacks. Recipe and photo is courtesy of PastaFits.orghttps://pastafits.org/. 1. Preheat oven to 375°F. In large pot of boiling salted water, cook noodles for 8 to 10 minutes or until tender but firm. Drain; let cool in single layer on baking sheet. 2. 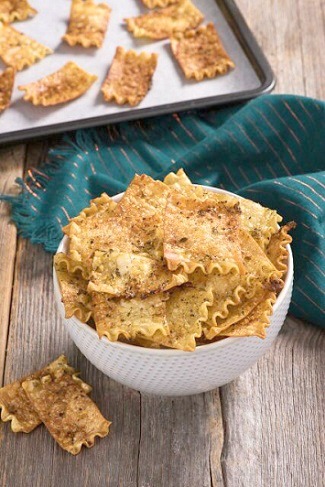 Cut noodles into bite-size pieces; toss with Parmesan, olive oil, garlic, Italian herb mixture, salt and pepper. 3. Spread in single layer on parchment paper–lined baking sheet; bake for 20 to 25 minutes or until crisp. Let cool.